1) Watching the preview lead to a hilarious discussion with my five year old of what Spanx are. He decided they are just pants you wear under pants. 2) Director Paul Feig (@paulfeig) and writer Katie Dippold (@katiedippold) called out the absurdity of performing an emergency tracheostomy in movies. 1) If the victim's choking is severe (no coughing, unable to talk, turning blue) call 911 and perform the Heimlich maneuver (see Groundhog Day). This is done by standing behind the victim, placing one had above the bellybutton with the other hand on top and then pressing quickly and forcefully upward with the closed fist. 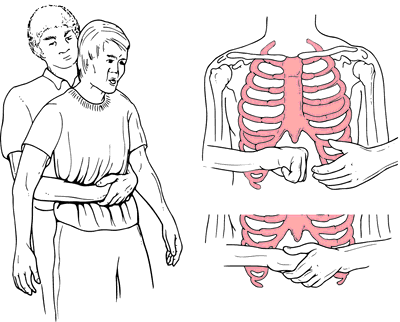 2) Continue the maneuver until the object is coughed up or the victim becomes unresponsive. 3) If the victim becomes unresponsive then begin CPR. In the end Detective Mullins (Melissa McCarthy, @melissamccarthy) follows BLS procedures (sort of) and relieves the choking. To avoid this fate just cut your fast food with a knife and fork. Like Emily Gilmore.